A big thanks to Wheelsuckers for providing me with the kit. It’s 6am on a Sunday morning. Breakfast is eaten, my bottles are filled and I’m almost ready to ride down to meet a bunch of my club mates in Guildford for the AAT Surrey Sportive. Instead of my usual club kit, I’m pulling on dhb’s Aeron Pro bib shorts and matching short sleeve jersey. The Aeron Pro range, from Wiggle’s in-house brand is billed as their high performance collection offering the “perfect balance of comfort and performance at a great value price.” Today’s 65 mile sportive, plus the ride there and back should serve as a fitting test. At 8am we’re called forward to start and from the gun the pace is higher than I was expecting. We’re soon whizzing through the undulating countryside. I feel very “pro” in the kit. The black/white colour combination with chequered detailing on the arms creates a stylish yet understated look. The cut is body-hugging. Not race-level aero cut, but it’s certainly close. Brand snobs may flinch at wearing Wiggle “own make” kit, but I am nothing short of impressed. Replace the dhb logos with ASSOS and nobody would bat an eyelid! 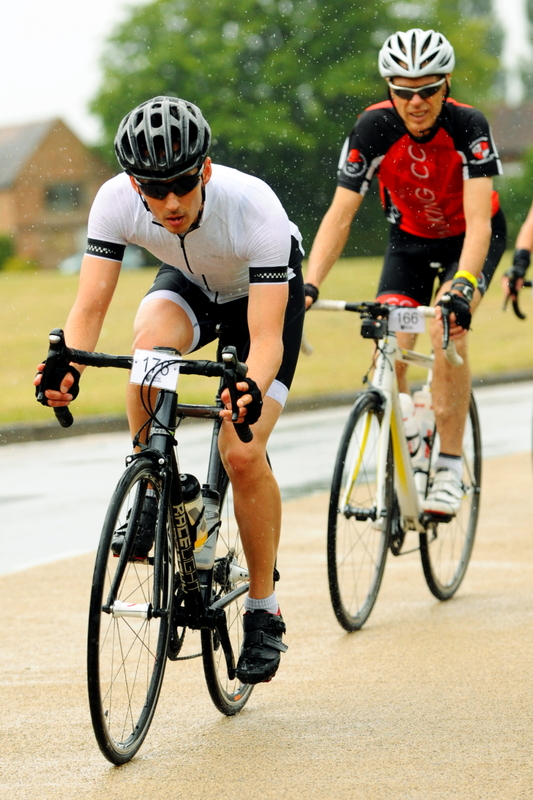 Full gas in the drops (through the rain) with club mate Steve H holding my wheel. I spend a large proportion of the ride hunkered low in the drops as the Woking CC express train hurtles along at full gas. 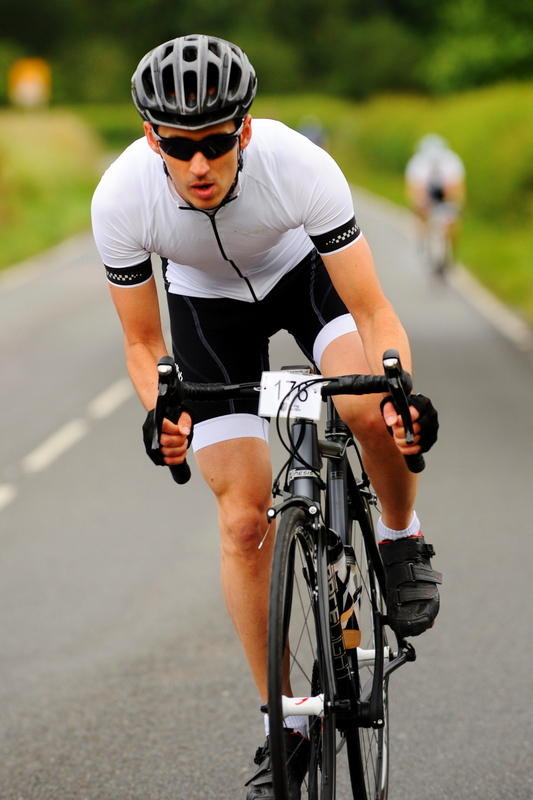 The jersey performs faultlessly, keeping me cool, comfortable and most importantly aero. The silicon arm bands remain flat against my skin and there’s minimal bunching around the front as I get low out of the wind. Chasing the guys in front I leap out of the saddle, stomping on the pedals. The leg grippers hold firm against my smooth cyclist thighs. No amount of Cavendish-esque sprinting or powering over inclines can shift them, ideal for comfort and cultivating laser sharp tan lines. The bibs come with dhb’s top of the range “Tour Air Cyctech” chamois pad. It performs respectably, but on longer all-day rides I’d be inclined to go for a little more padding. After around 80 miles in the saddle I found myself shuffling a little to remain comfortable. The bib shorts come with dhb’s top level chamois. By 10am the miles are flying by and we’re covering ground at an exponential rate. The temperature continues to rise with the pace, but paired with a summer base layer I am kept cool and well ventilated. Mesh panelling in all the right areas aids this. On longer drags I find myself reaching for the zip for added air flow. There’s no fumbling, with the tab easy to locate and smooth in operation. Likewise reaching behind into any of the well-proportioned three rear pockets is a breeze. Refuelled on chocolate brownies at the final feed station there’s talk of relaxing for the home stretch. Of course this never materialises and we’re once again bombing it. In fact as we edge closer towards the finish the pace is lifted even higher. What was in those brownies? A smooth section sees our rolling paceline nudge 28mph! Like a moth hypnotised by a 60W bulb I’m focused solely on keeping contact with the wheel in front. Regardless, I’m effortlessly comfortable thanks to the smooth stitching and expert tailoring found in the bibs and jersey. Crossing the finish back in Guildford I’m glad of the respite, it’s been a fast and ferocious ride. Sure it’s not a race, but I later learn I’ve finished 28th quickest overall (thanks in no small part to the faster boys driving the Woking CC road train). I finally arrive home after a furious 95 miles, throw down a recovery shake, collapse on the couch and reflect over the ride. I’ve absolutely fallen in love with the jersey. It’s sublime. Perfectly cut, professional looking, three rear pockets plus a fourth zipped one, full-length hidden zipper, arm hugging silicon grippers and ventilation in all the right places. The bib shorts are not far off perfect either, let down ever so slightly by the chamois pad (a purely personal preference). Compared to the CAPO Pursuit kit I reviewed last year the dhb Aeron Pro range is a cut above and then some, plus it’s cheaper too. I’d have no hesitation in recommending this kit to anyone after a tight fitting summer combo. This is one set of cycling kit that is going straight to the top of my “go to” list! The dhb Aeron Pro short sleeve jersey and dhb Aeron cycling bib shorts retail at £49.99 and £64.99 respectively and are available exclusively through Wiggle online.